Bring summer indoors with the fresh citrus scent of grapefruit ! Cleansing, Toning, Moisturizing in an all- in- one recipe for a fresh face facial. You can't help but feel uplifted with grapefruit's natural happy scent and glow it gives your face. this simple, yet effective home facial. 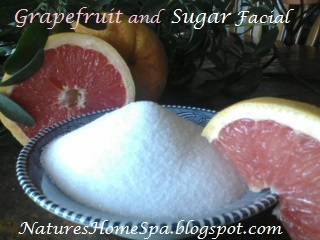 Grapefruit is high in vitamin C which is essential in collagen production in the skin. Sugar is a natural exfoliate that removes dirt and sebum from the skin, unclogging pores. Giving you a fresh faced glow by removing dead skin cells. Sugar is an alpha hydroxy acid (AHA) whose natural glycolic acid protects, moisturizes and helps to condition the skin. I take a cup of sugar, put it in a clean plastic jar, then pour in grapeseed oil, gradually, a tablespoon at a time until you get the desired texture. Some folks like a lot of oil, some less. Your choice. Then take the juice of 1/2 small grapefruit and begin to add it to your sugar mixture, stirring all the while, stop pouring when you get your desired texture. If too juicy, add more sugar. You will see some sugar melting. That's it. Store covered in frig for a week. I choose grapeseed oil for my facials because it is a light oil, and is not greasy. It absorbs quickly into your skin and does not clog pores. Easy to find in your grocery store oil aisle. If you prefer a heavier oil try olive. Yes, you can use grapefruit juice in place of fresh grapefruit, absolutely. Don't scrub your face harshly with any facial scrub, just gently massage into your skin in circular movements, and rinse off with cool water, pat dry.